Indian Gold Label Athlete & Asian Marathon Champion Gopi T at the registration launch of the Airtel Delhi Half Marathon 2018. 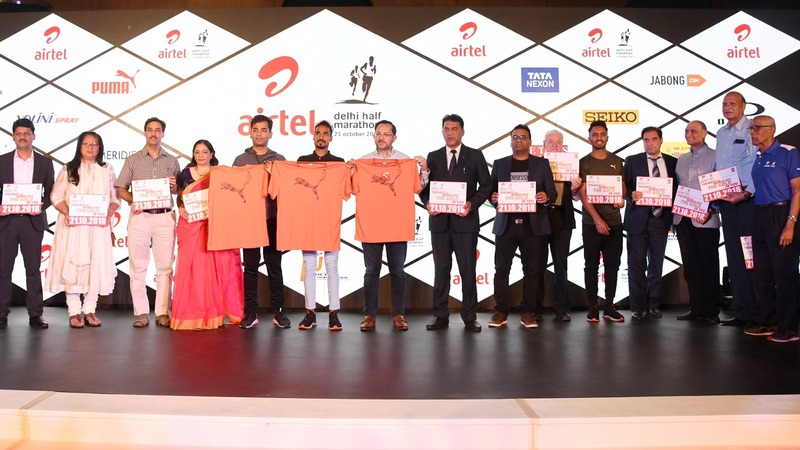 Gopi launches the PUMA Race Day Tee along with Abhishek Ganguly, MD, PUMA India and Ravindra Singh Negi, CEO – Delhi & NCR, Bharti Airtel and all the partners of the event. Procam International, pioneers of the distance running movement in India, today announced the opening of registrations for the world’s most prestigious Airtel Delhi Half Marathon (ADHM) 2018. The IAAF Gold Label Race will witness over 35,000 participants across five categories, i.e., Half Marathon (21.097km), Great Delhi Run (6km), Open 10K, Senior Citizens Run (4.3km) and Champions with Disability (2.4Km), run along one of the fastest and picturesque course of the capital on October 21, 2018. Sport has the power to transcend borders of boundaries, economics, age, gender and generation; Airtel Delhi Half Marathon is a befitting celebration of this ethos. From starting a running movement in Delhi to inspiring women in the city to run, creating a wave of consciousness on health & fitness, to attracting the world’s best distance runners and re-kindling the spirit of giving, Airtel Delhi Half Marathon has been at the forefront of change. Continuing their support in bringing the world-class experience to Delhi, telecom giants Bharti Airtel will be the title sponsors for the eleventh successive year. Ravindra Singh Negi, CEO – Delhi & NCR, Bharti Airtel said, “We are pleased that the Promoters have taken into account the feedback from Airtel, our customers and citizens at large and brought forward the race day to October 21. We appreciate the genuine effort that has been put in by Procam and other stakeholders, including the local administration, as shifting an event of this scale and stature, with participation from top international athletes, is a highly complex task. We hope this will help address some of the concerns relating to air pollution and the well-being of the participants and believe that all stakeholders need to continue collaborating and build on this positive initiative. We are also happy to note that Procam will be taking additional measures to ensure the well-being and safety of all participants. Delivering top-notch running experiences in India is a promise that Procam International lives by. Each year efforts are taken to re-invent and add new elements to the race and ensure ADHM is truly - A Running experience. OPEN 10K RUN: After introducing the category for the first time in the last edition, the 10K run will now be open for all amateurs including non-charity runners. 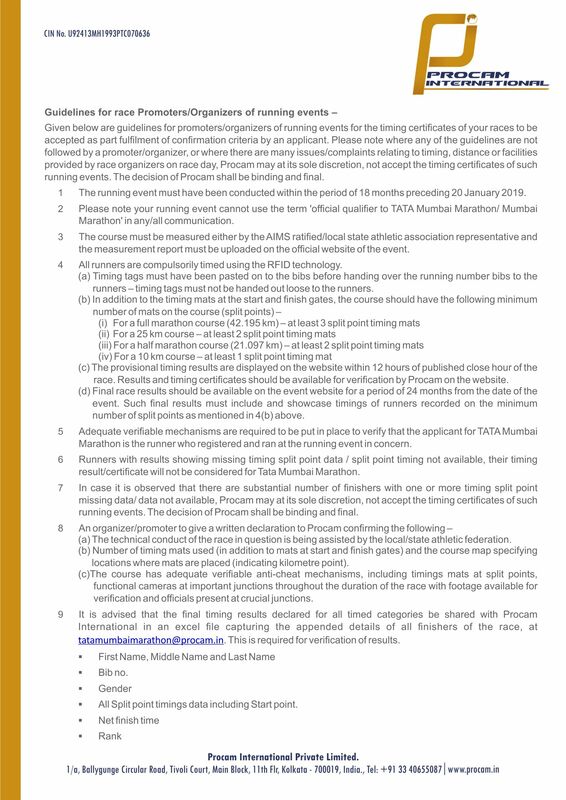 This will give an equal opportunity and encourage new aspiring runners to experience the challenge of distance running. Applicants can apply under timing criteria by submitting their valid timing certificate, if the applicant cannot produce the timing certificate the application will be accepted under general category. The success of any sporting event strongly depends on its like-minded partners. Over the years, the most respected brands have partnered with ADHM for the transformational role it plays in bringing individuals, organizations and institutions together. For the 2018 edition, there are two new brands who have joined the bandwagon. Oakley, Performance Eyewear Partner: Oakley is one of the leading product design and sport performance brands in the world, chosen by world-class athletes to compete at the highest level possible. The brand holds a very prominent position within the sports eyewear category, offering men and women an extraordinary product line that appeals to sport performance and active lifestyle consumers. Rajan Handa - Brand Business Manager, Oakley India, said, “It’s a great moment for us to partner with Airtel Delhi Half Marathon 2018, one of the most prestigious half marathons in the world. We at Oakley are thrilled to be “Performance Eyewear Partner” of the four distance running events ardently promoted by Procam in India. People across the country are embracing an active lifestyle through various sports, and running clearly is at the forefront of this movement. This legion of people living an active lifestyle is defined by Passion, Progression and Performance - values that are deeply espoused by Oakley. Oakley has always pushed the envelope of technology, in pursuit of innovation, to give world class athletes products that help them enhance their performance. We look forward to a long and successful association”. Tata Nexon, Driver By Partner: After its successful association with premier distance running events like the Tata Mumbai Marathon and Tata Consultancy Services World 10K - Tata Nexon, the lifestyle SUV from Tata Motors with Level Nex Design, performance and safety has extended their association with ADHM as the ‘Driven By’partner. Indian Gold Label Athlete & Asian Marathon Champion Gopi T at the registration launch of the Airtel Delhi Half Marathon 2018. Gopi launches the PUMA Race Day Tee with Abhishek Ganguly, MD, PUMA India and Ravindra Singh Negi, CEO – Delhi & NCR, Bharti Airtel. PUMA: Continuing their association with the event and for the benefit of the runners, all the registered Half Marathon participants will receive the exclusive PUMA Race Day Tee, while first 1000 runners will be awarded the PUMA Finishers Tee. Abhishek Ganguly, MD, PUMA India, said “We are excited to be associated with ADHM on their fourth edition. Running has immense potential in India, and we want to do everything we can to nurture this ecosystem. Associations such as these are in line with our pursuit of encouraging more people to adopt a healthier lifestyle. He further added, “It is also a special occasion for us as we unveil our latest running footwear, The Hybrid. PUMA as a brand is always looking at new and innovative ways to enhance the running experience. The Hybrid features breakthrough foam technology that combines comfort and cushioning for longer runs. We are certain that HYBRID is an ideal running shoe and as a statement of this belief we are launching a ‘No-Questions-Asked Refund’ offer for ADHM registrants. This allows ADHM participants to buy the shoe and return them within a month incase of any concern. Vivek Singh, Jt. MD, Procam International said, “This year is a special milestone for us, as Procam completes 30 years and to see our vision taking shape in this fashion is very satisfying. When we introduced this distance in Delhi, we always believed that it had the potential to be one of the world’s most prestigious races and importantly get Delhi running. The growth in the international profile, participation and support from the city is a testament of the efforts we have put in to achieve our vision. “The unwavering faith and support of all stake-holders, led by our title sponsor Airtel, with us for 11 years now, has contributed to our growth. We would also like to extend our deepest gratitude to all other partners, including new partners Oakley and Tata Nexon for their belief and passion and welcome them on-board,” added Singh. Registration for the Half Marathon and Open 10K will commence on Friday 10th August at 0700 hrs and stay open until, 1900 hrs on 7th September 2018 or till running places are filled, whichever is earlier. A kaleidoscope of colours and showcasing the spirit of the city – the Great Delhi Run, Senior Citizens’ Run and the Champions with Disability Run registrations will open on Friday, 10th August 2018 at 0700 hrs and close at 1900 hrs on Friday, 28th September or when filled, whichever is earlier. Over the years, the Airtel Delhi Half Marathon has successfully empowered women in the capital to own the streets of Delhi. Each passing year has given rise to new breed of quality women runners and to continue this trend forward, there is limited number of running places reserved for women applicants who cannot produce a timing certificate under women’s criteria, in the Half Marathon and the Open 10K. The Half Marathon runners will be prioritized in six-line up sections on race day as per the timing certificate submitted along with their applications - under 1 hour 45 minutes; 1 hour 45 minutes to under 2 hours 06 minutes; 2 hours 06 minutes to under 2 hours 33 minutes; and 2 hours 33 minutes to under 2 hours 57 minutes; 2 hours 57 minutes to under 3 hours 21 minutes; 3 hours 21 minutes and above. The Open 10K Run will be prioritized in four-line up sections on race day as per their timing certificates submitted during registration - under 1 hour; 1 hour to under 1 hour 10 minutes; 1 hour 10 minutes to under 1 hour 20 minutes and 1 hour 20 minutes and above. Duly filled entry forms with the requisite entry fee can be mailed to P.O. Box No. 3634, Lajpat Nagar, New Delhi – 110 024. For further details log on to https://adhm.procamrunning.in, or call the event helpline +91 96500 33333, Monday to Saturday between 10 am and 7 pm.